Babafemi Ojudu, a political adviser to President Muhammadu Buhari, on Sunday thanked safety measures and quick response of security personnel for saving himself and 11 others who were in the helicopter that crashed on Saturday. 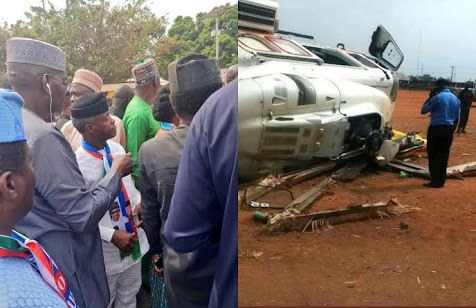 Mr Ojudu was on the delegation of Vice President Yemi Osinbajo when the accident occurred as their chopper was landing in Kabba, Kogi State. The incident occurred around 3:00 p.m. Messrs Osinbajo and Ojudu escaped unhurt with 10 other persons on the helicopter. The minister of state for labour and productivity, Stephen Ocheni, was also onboard. Caverton Group, an air charter service which operated the Augusta A139 helicopter, blamed “unusual weather conditions” for the crash in a preliminary statement. Further investigations are expected. In a Facebook update, Mr Ojudu said he was calm during the accident, although the focus was largely on the vice president’s safety. “To family, friends and associates thank you all for your concern and show of love and affection. I can’t thank you enough. It was a miracle we survived. “The belts did a marvelous job and so were the security men on ground who quickly pulled us out of the wreckage not minding their own safety. “We were also calm all through the ordeal. There was no panic of any kind.